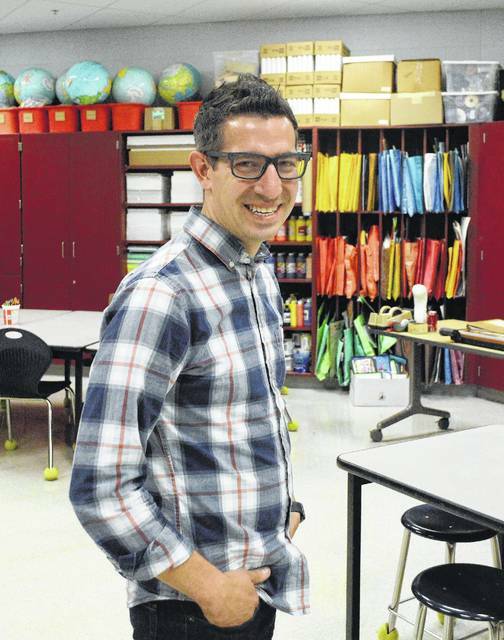 Jonathan Juravich called the last few months a “whirlwind” after he found out about his nomination for the 2018 Ohio Teacher of the Year award in May. He was surprised every time he was notified that he made it the next round. But he kept that astonishment to himself, not even telling his family and friends he’d been nominated. “When do you tell someone you’ve been nominated for this award?” he said. But the secret was out when the Ohio Department of Education announced that Juravich was Teacher of the Year for the State Board of Education District 6 and one of five finalists for the statewide recognition last week. The state superintendent will announce the recipient of the award this fall. “The Ohio Teacher of the Year program recognizes influential and inspiring educators who demonstrate some of the things I love most about teachers: they take our system to higher heights and continue the path toward excellence,” State Superintendent of Public Instruction Paolo DeMaria said in a press release. The Ohio Department of Education invited school districts to nominate teachers for the District 6 award. Liberty Tree Principal Terri Caton was the one who submitted Juravich’s name for consideration. She said he has the ability to get people involved. She noticed this trait about six years ago when he spearheaded efforts to raise money for a student diagnosed with cancer. “I think he can be a good principal one day,” Caton said. State Board of Education member Dr. Antoinette Miranda worked with a committee of educators, parents and business leaders to select Juravich as the recipient. “Mr. Juravich exemplifies what truly great teachers are made of. He is creative, compassionate, active in our community, incredibly talented and he truly cares about each student,” she said in a press release. Juravich said he was humbled by the recognition. “It’s just a validating experience,” he said. Amy Juravich said the word “proud” does not begin to describe how she feels about her husband’s accomplishment. Amy added that he’s a great father of his two children: Josie, 4, and Ari, 5 months. In 2005, Jonathan Juravich graduated from Otterbein University with an art teaching certificate and joined the Olentangy Local School District. Since then he traveled between four different elementary schools until he became a permanent art teacher at Liberty Tree in 2007. But Juravich is still a traveler of sorts as he engages with elementary school, middle school, and college-aged students once a week during the school year. After teaching young artists at Liberty Tree, Juravich walks over to the attached Hyatts Middle School to coach its cross country and track and field teams. He then drives over to Otterbein for a weekly course to instruct future art teachers about elementary and secondary art education in the fall and spring. “It’s a really nice balance,” he said. Juravich received his master’s degree in art education from the Art Academy of Cincinnati in 2011. In addition, Juravich often collaborates with the Columbus Zoo and Aquarium. Such collaborations include ZooTeen art camps, consultations, and being a guest artist at events. Some of those activities involve having armadillos, snakes, penguins and turtles walk across a painted canvas. Juravich said it’s a way to bring conservation into the discussion. “It’s cool that a penguin walks across the surface, but there’s a much deeper meaning,” he said. Juravich said he’s considered moving up to an administration role, but said he loves his current profession. “I value arts education and what it does for my students. It gives them self confidence (and) opens their eyes,” he said. Olentangy Liberty Tree Elementary School art teacher Jonathan Juravich is one of five finalists for the 2018 Ohio Teacher of the Year. He was selected Teacher of the Year for the State Board of Education District 6. 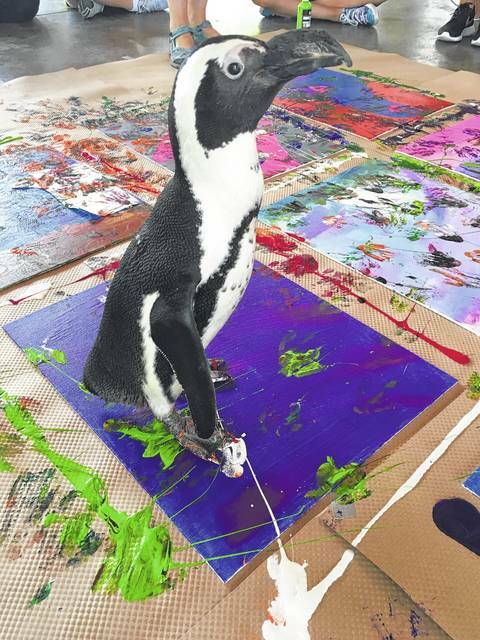 A penguin walks across the painted canvass during one of Olentangy art teacher Jonathan Juravich’s activities in collaboration with the Columbus Zoo and Aquarium.